Even though your business is doing everything correctly, If you aren’t seeing the results you need with revenue, you might realize that it could possibly because of the website platform you’re using. Behind every business’ website is a story. Whether it’s filtered through success or is founded on a transfer from one website to another, you can always find a point in time where a switch has been made. Based on our personal experience, here is a success story founded through switching platforms to a WordPress and Mobile-Compatible website. Integrated Technology Services, LLC is an online presence that offers services in legal education courses. They are founded and based in the Philadelphia area. From an online perspective, they can attribute most of their success to their website presence. 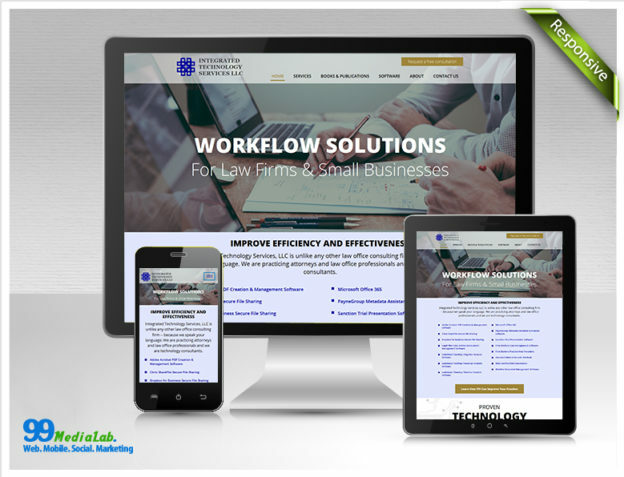 They also sell both legal education and business software packages for law firms nationwide—which requires an online platform and dealing with their customers and future clients through their website and online contact. From the beginning onward, ITS recognized its need for change when the numbers came in. Their website was non-mobile responsive. this day-and-age, most customers, and clients are accessing websites through their phones—so the lack of compatibility can be an extremely costly issue. Their website also ranked rather poorly on most engine searches due to their lack of SEO-friendly text. In a nutshell, their website was attracting very little traffic, leading to extremely low numbers when it came to leads that were just traced back to their website. After recognizing what the problems were, a solution was drawn specifically to target these issues to get rid of the negativity around their online presence. Once a WordPress website was developed and designed, they launched it alongside its mobile-responsive site counterpart. With the possibility that users could access their new user and mobile-friendly site, there was no reason that the popularity of their website could increase over twofold. The company also recognized that they needed to improve their online presence and website by adding CTA’s places on the site. To add even more to the improvement-seeking process, ITS also had a Yoast Plug-In installed to truly improve their SEO and help them rise in the rankings when it came to online engine searches. Not only did ITS feel better about their improvement in their online presence, they were more likely to share the website with more clientele and increase their revenue even more. Although they found success outside of the website, the possibility to draw clients even more so through their online presence was an eye-opening situation for the company. Improved search rankings because of the added-in SEO and search-engine friendly specific add-ins to the website. Not every website works for every business. You have to draw what you need as a business and match it with a website that can meet you with those needs. Finding that magical relationship between website and business can not only boost the morale in your company alone, giving your employees the confidence to give out business cards and refer new and potential clients back to the website, it can also draw even more clients and attention strictly from the website alone. With just a simple switch or by paying attention to extravagant detail in your business’s online presence, it can make all the difference your business needs to find the success it has been looking for.